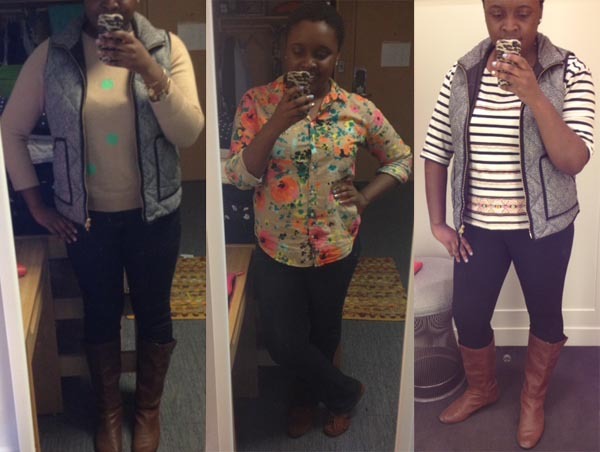 3 Days of Style: Jessica D.
My Style in 3 Words: Colorful. Preppy. Comfortable. Background: Because physical therapy isn’t exactly a major based in creativity, I love using personal style and fashion as a means of expressing myself. Fall is by far my favorite season to dress for. Layers and classic pieces such as riding boots and sweaters are my staple items. I think most people associate fall with warmer and more subdued colors. However, I love to dress with vibrant pops of color throughout the year, regardless of the temperature outside. Day 1: In this outfit, I am wearing one of my favorite new pieces for the season, the quilted puffer vest. This item has become such a staple in my fall wardrobe because of its versatility and practicality. Not only does it go with virtually anything, it provides the perfect amount of warmth in these early days of fall. I kept the rest of my outfit relatively simple so that the pops of green on the sweater would be the focal point. I am not a fan of wearing just leggings as pants, so these pixie or ponte pants are a happy medium. They’re much thicker and more structured than leggings but still provide the same level of comfort for an 8 a.m. class! Day 2: It was a bit warmer on day 2, so layering up was not necessary. I love a good button down because it gives the impression that you put a lot more effort into an outfit than you actually did. I’m absolutely obsessed with the colorful flowers on the shirt – they remind me of a watercolor painting. I paired this look with a simple pair of jeans and moccasins to keep it casual. Day 3: Once again, my quilted puffer vest has made an appearance. This was another weekend outfit, so I tried to keep it casual and comfortable. I love the way the stripes in my top look against the chevron herringbone in the vest. The embroidery on the bottom of the top is my favorite part, as it adds that pop of color that I try to include in all of my outfits.